Aquatic Sports and Expeditions was created to satisfy the real needs of all the divers who come to enjoy the magnificent Cozumel reefs of the western Caribbean Sea. We certainly believe that your experience with us will create magical memories which will last a lifetime. 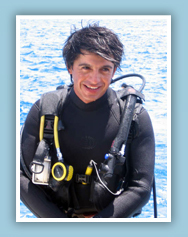 Sergio Sandoval Jr. has been involved with the dive industry since he was a small child, and his family’s love of the coral reefs made him want to be a part of reef conservation programs. Now he is an instructor and a dive master, who shares the expertise learned through the years of training he received from his dad. Sergio has realized the great opportunity to show the world the best parts of the reefs, and, through his active participation in the Coral Reef Alliance, Mexico’s National Marine Park education program, and the international science education organization, Swim For The Reef, he demonstrates the importance of the reefs to our community and the world every day. Thank you so much for visiting our web page. Your Cozumel friends and hosts at Aquatic Sports and Expeditions invite you to enjoy the wonderful interaction and great view of the healthy, vibrant coral reefs and warm temperatures of the clear turquoise waters of the Mexican Caribbean Sea. Enjoy our personalized service, offering you our experience and knowledge for the security and comfort that you and your family deserve. Let us make your rewarding underwater experience unforgettable, no matter what your scuba dive level is now, from beginner to advance. Even if you have never tried diving but always wanted to see the beauty beneath the surface, we have a very safe and easy, one-on-one, step-by-step program that will get you there quickly and safely. 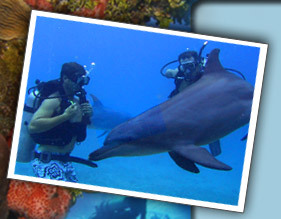 If you are an advanced diver, come with us to the reefs that maximize your underwater time and diving skills. All of us can enjoy the beauty of the underwater world in our own way. All credentials of certification are welcome: PADI, NAUI, SSI, FMAS, and CMAS. Paul Ellis is president and founder of Swim For The Reef, Inc., a U.S.A.-based, international non-profit environmental organization, whose mission is gaining knowledge about, and protection of, the coral reef systems of the world. Paul Ellis has been an active scuba diver since 1974 and a PADI Divemaster. Through his own dive mask he saw the motivation to make a positive impact on the immensely important near-shore environmental systems we know as coral reefs. In order to raise world awareness and to help facilitate education related to these complex ocean/shore issues, Paul Ellis spent five years in training as preparation for an ultimately successful, forty-mile, 14.5-hour, open water swim across the Yucatan Channel between the island of Cozumel and the mainland city of Cancun, Mexico, which was accomplished in August of 2004. Since the swim, Paul Ellis has become even more closely involved with the island of Cozumel and has been a permanent resident for the past two years. He formed a partnership with Sergio Sandoval, Jr. in Aquatic Expeditions to serve the diving public and Swim For The Reef’s research interests by investing in the beautiful, multi-purpose, 46’ dive boat, Swordfish, as well as contributing his many years of business experience. In addition to the dive business, Paul Ellis is active in the international education community. The State University of Quintana Roo and his foundation, Swim For The Reef, Inc., have formed a significant partnership for the purpose of inviting students from around the world to come to Cozumel and study, learn, and advocate for the importance and beauty of the coral reefs of the western Caribbean. © 2019 AQUATIC SPORTS & EXPEDITIONS. ALL RIGHTS RESERVED. Web Design by Seed Technologies.